Sub: APSSA, Amaravati — Preparation of AWP&B for the year 2018-19 — Conduct of State Level Orientation to District Sectoral Officers on 05-12-2017 in the Conference Hall, O/o. State Project Director, APSSA, Amaravati — Certain instructions & Detailed schedule — Communicated - Reg. Ref: D.O.No. 11-2/2017 EE. 13, dated. 15-11-2017 of Maneesh Garg, Joint Secretary, MHRD, New Delhi. The attention of all the Project Officers, SSA is invited to the reference read above the Joint Secretary, MHRD, New Delhi has communicated the schedule of AWP&B 2018-19 along with detailed guidelines. It is also informed that the Appraisal exercise will be on using online Shagun Portal for assessing the progress made by States / UTs on implementation of the AWP&B of SSA for 20 17-18. It also includes review of the action taken against the PAB commitments for 2017-18, both State specific commitments as well as standard commitments. It is also suggested to pay special attention to Learning Outcomes, National Achievement Survey, Coverage of Aad.har, Rationalization of Schools, Digital Initiatives, Strenthening U-DISE and SDMIS, Teacher salary and deployment, Convergence, KGBV, Special Focus Districts (SFDs) and CWSN. All the Project Officers, SSA in the State are informed that 26 tables and costing sheet are to be developed for preparation of district plan 2018-19 and for preparation of district plans, School Habitation and Mandal Plans has to be prepared. 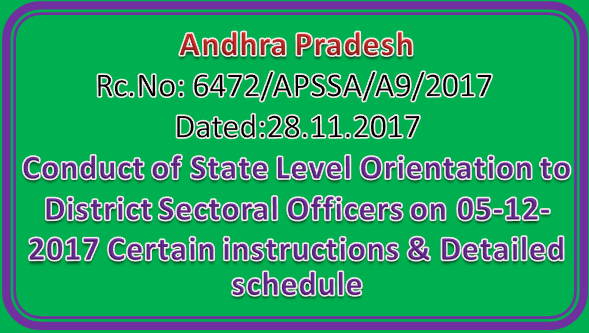 The Project Officers, SSA in the State are also informed that it is proposed to conduct State Level Orientation to District Sectoral Officers in relation to Annual Work Plan & Budget for the year 2018-19 along with U-DISE 2017-18 on 05-12-2017 in the Conference Hall, O/o. State Project Director, APSSA, Amaravati. Therefore, all the Project Officers, SSA in the State are requested to depute concerned Sectoral Officers who are involved in preparation of entire Annual Work Plan & Budget and also in U-DJSE on 05-12-2017 in the Conference Hall, O/o. State Project Director, APSSA, Amaravati without fail. A detailed schedule and guidelines is communicated herewith. This has the approval of the State Project Director, APSSA, Arnaravati. Vide publicity shall be given in the districts in connection with Micro Planning, conduct of Gramasabhas and participation of Public Representatives. Habitation Education Plan booklets shall be printed @ 1 for each habitation and School Development Plan formats @ 1 for each school with 10% extra for use at the training programmes. Involve DIET faculty at district level orientation programme. Constitute District level monitoring teams with DIET faculty and Sectoral Officers in the district and allot 2 to 3 mandals to each member to observe school complex level orientation and Grama Sabhas at habitations. Members of the mandal planning teams should also visit the Gratna Sabhas. The budget towards payment of TA, DA to observers may be met from the budget head of REMS I Management Cost of concerned DPOs for the year 2017-18. Conduct district level I Divisional level trainings to mandal teams in 2 spells simultaneously in parallel batches based on number of mandals. Each batch should not exceed 50 participants. Distribute Habitation & School Development Plan booklets and mandal plan formats during the training programme. Conduct orientation to Habitation Planning Core Teams at school complex level. School Complex level training to Habitation Planning Core Teams may be organized simultaneously in two clusters so as to complete as per schedule and plan these well in advance so that the trainings could be completed within 2 days. The presence of observers is mandatory during the school complex level orientation to habitation core teams. Conduct of Grama Sabhas on 12th December 2017 by giving wide publicity and involve public representatives, read out the RTE Act in the Grama Sabhas to make them aware of the Act. The expenditure towards conduct of Gram Sabha may be met from Community Training head. All MEOs may be instructed to utilize the services of CRP’s as observers at Gram Sabhas and monitor the preparation of habitation plan. 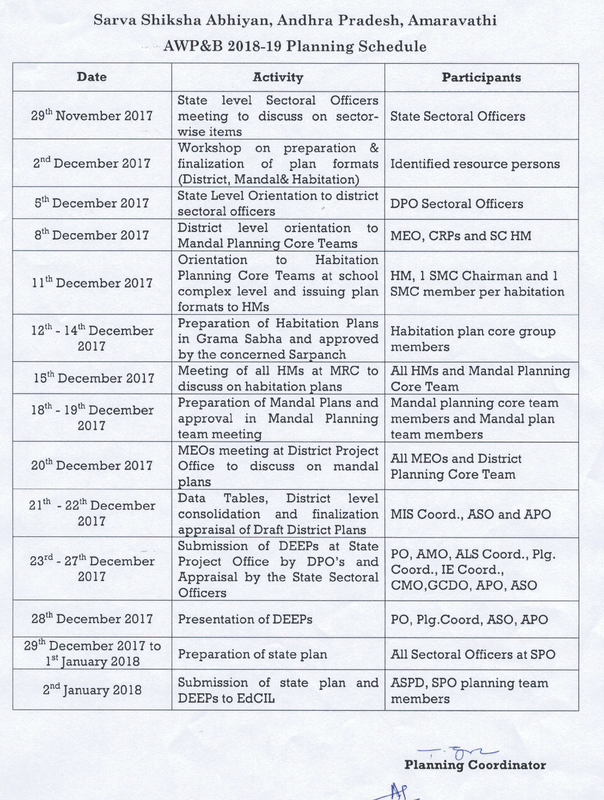 MEOs may be instructed to prepare and submit the habitation and mandal plans as per schedule. Utilizing the services of CRP’s I MIS. The District Collector may be requested to address Sarpanches through MPDO concerned for organizing Gram Sabhas. Similarly the MPDOs / MEOs may be instructed to conduct mandal level meetings with Mandal Planning Teams under the Chairmanship of MPP I Special officer for approval of mandal plans. The P0’s may be requested to take the services of DLMTs as when required. All the District Sectorals are instructed to monitor the overall plan programme especially their intervention proposals. Preparation of the District Plan is not a one man activity and the responsibility should be taken up by the District Project Office as a whole.